Are you a straight up, old school gangster? And when we say old school, we mean really old school. Like, 1920's old school. Then this swanky Plus Size Smooth Criminal Costume is right up your alley! It takes one bold wiseguy to strut around town in a white suit, and not just because their particular line of work can get messy from time to time (seriously, who eats marinara sauce while wearing white??). It also makes them stand out in a crowd, and during the Roaring Twenties, when Prohibition is in full swing and sharply dressed gangsters probably make their money off of bootlegged giggle water, standing out doesn't make them seem like such "wise" guys, after all. But that's what makes them such smooth criminals! It takes nerves of steel to drive past a group of cops in your shiny new Cadillac and your crisp, white suit. And if they try to stop you, just slip them a couple hundred bucks that you made from your last job. It's all good, there's plenty more where that came from, capisce? Not that we condone bootlegging or bribing police officers, but we're just saying, if you were a gangster in the 20's, that would be a pretty smooth move to pull off! 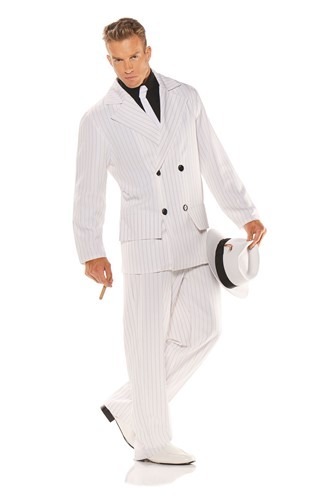 This classy white, pinstripe suit can almost make you look that cool, too, and it comes with a black shirt front and attached white tie, for a real swanky vibe. Then, just put some pomade in your hair, and get yourself some white dress shoes and a fedora, and you'll look like a true vintage mafioso!